A solo sea kayak expedition in East Greenland's Ammassalik region: It's melted!! Whoops! I have just been informed that that is most likely water laying on top of winter ice. It should be clear if that's the case in a few days time. 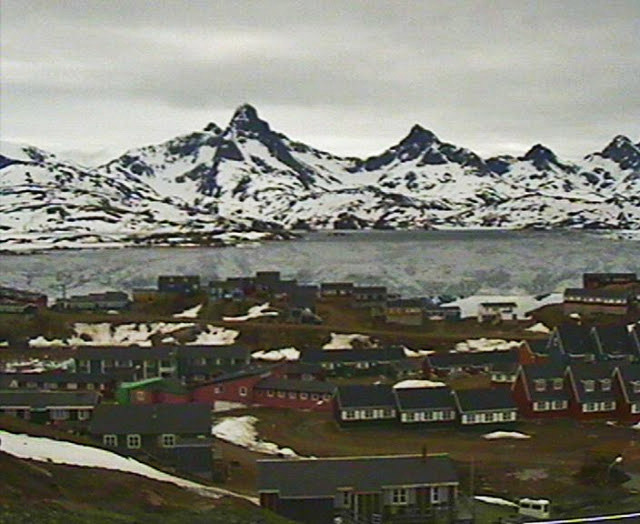 Well, today Tassiilaq had a maximum temperature of 7 degrees C.
And the days are lengthening rapidly.It's only 14 days to the summer Solstice when the sun will rise at 00.55 and set at 00.05! So the town will have only 50 minutes with the sun below the horizon.